I love it when people I stalk on social media also stalk each other, and end up collaborating. It makes me feel like life makes sense. And when both parties are creative powerhouses, you can be sure that something beautiful will be created. Having seen what interior design duo Jersey Ice Cream Co. came up with when they worked with Beth Kirby from Local Milk (which you can check out by clicking the link), I was excited to see them team up with another one of my creative heroes. This time it was in the London flat of food writer and photographer, Skye McAlpine who blogs at From My Dining Table. The finished product was perfection. Take a look. The brass utensil rail is pretty, but practical and keeps Skye’s collection of copper and enamelware in easy reach. 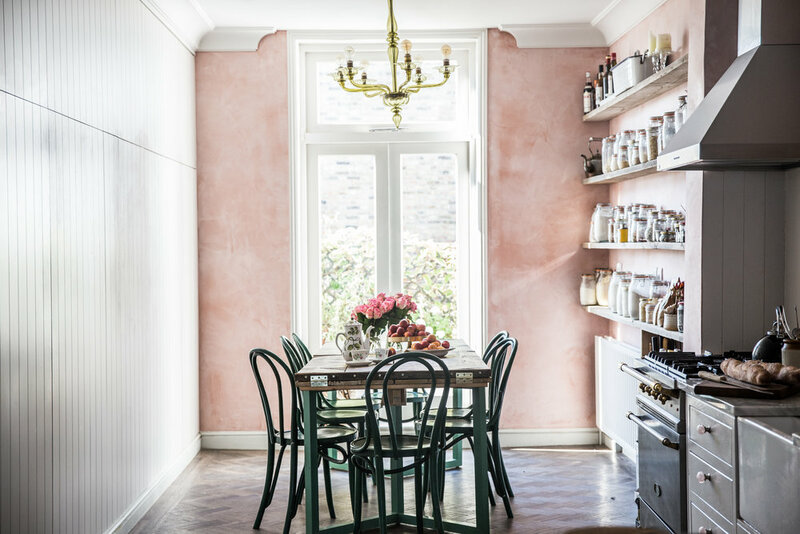 I just love how the forest green of the bentwood chairs, together with the timber finishes on the shelving and dining table, ground the pink plasterwork. It looks feminine but in a soft, romantic way- not too twee or girly. Of course the rustic dining table also serves as a backdrop for some of Skye’s stunning food photography. The marble-topped console table was made by Jersey Ice Cream Co.’s Percy Bright. Percy cut his teeth working in the carpentry team at Anthropologie, creating their store displays. Considering how utterly obsessed I am with their displays, this makes Percy my hero. For a room in London with quintessentially French-style toile wallpaper (from Zoffany, B.T.Dubz), this space kinda reminds me of the Caribbean. This analysis may be a little askew however, considering I’ve been to the Caribbean zero times. But the pineapple lamp, parrot artwork, bamboo-legged nightstand and cane Margot bedframe from Loaf.com give it a little tropical vibe, no? I love the addition of an industrial style Anglepoise lamp. It balances out the whimsy of the pineapple House of Hackney lamp on the other side of the bed. All photography by Skye McAlpine. Quotes from Skye were taken from an interview with Cup of Jo.